No artist has ever been more obsessed with the possibilities of artificial perspective that Paolo Uccello (Florentine, 1397–1475). Like Piero della Francesca, he used the new technique to create a magic world of his own. Uccello’s provocative, visionary subjects (the Noah fresco in Santa Maria Novella, and the Battle of San Romano in the Uffizi) put him up with Piero della Francesca and Botticelli as the most intellectually stimulating of quattrocento artists. What little we know of his life comes from Vasari. His name comes from his fondness for painting birds (uccelli). As a child he was apprenticed to Lorenzo Ghiberti who he always remained close to; he was also a good friend of Donatello, so much so that he named his son Donato after him. Uccello began to gain a reputation with his frescoes on the book of Genesis in the Santa Maria Novella's Green Cloister. In 1425 he was employed by the Venetians to design the mosaics for San Marco (works all sadly lost) before returning to Florence in 1432 to paint the cloister of San Miniato and the striking illusionist fresco of Sir John Hawkwood in the Duomo (where he also painted the clock, and two stained glass windows). In the 1450s he painted his masterpiece, the three great panels of the Battle of San Romano for the Medici Palace (now divided between the Uffizi, the National Gallery in London and Louvre). Uccello's contemplation of perspective made him increasingly eccentric in his later years, and he died poor and lonely, and was buried in his father's tomb in Santo Spirito. 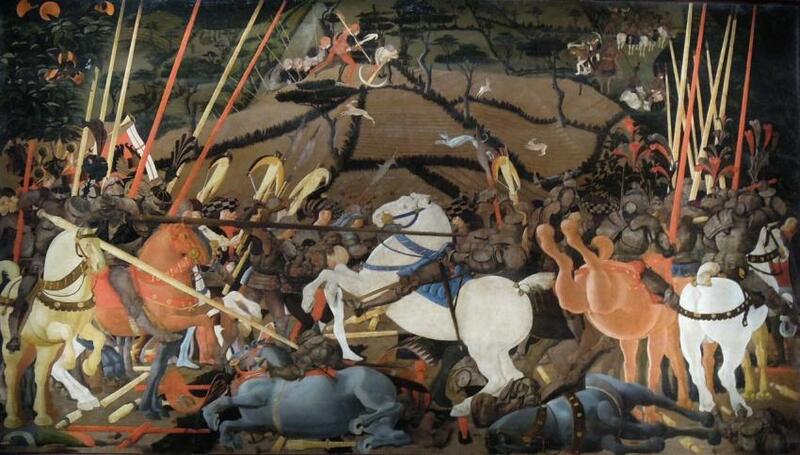 Other works by Uccello are in San Miniato al Monte and the Museo Diocesano di Santo Stefano al Ponte.